Wyndham Palm Aire is a beach resort in sunny South Florida, set among lush landscaping, endless palm trees and easy access to the beach. 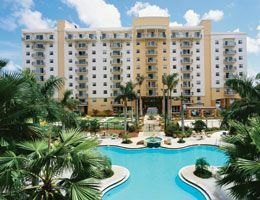 Owners who purchase a Wyndham Palm Aire timeshare for sale can spend hours indulging in services at the Spa at Palm-Aire or exciting nights at the Isle Casino and Racing at Pompano Park, offering a gaming casino, live harness racing and various dining venues. Accommodations come in many sizes to fit large or small parties while offering several amenities you’d find in a home-away-from-home. Activities around the resort range from those to keep kids active while on vacation to sports, water events, shopping, museums and more. 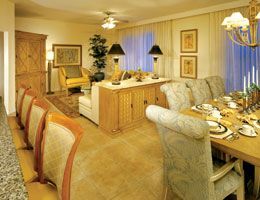 The resort is designed in a modern, yet casual style with suites available for every type of vacationer looking to buy Wyndham Palm Aire timeshare. Studio suites feature a king-sized bed and private balcony. One-bedroom suites offer a private bedroom and full kitchen, while two-bedroom suites feature a master and guest bedroom and whirlpool tub. All rooms offer the comforts of home with cable TV, alarm clocks, DVD players and radios, among other items. One- and two-bedroom suites give guests the affordability of being able to cook their own meals as they choose, in addition to giving kids or others guests their own separate quarters. Wyndham Palm Aire offers an array of activities for guests of all ages and groups of all sizes to take part in. For fun in the water, guests may enjoy one of four swimming pools, a children's pool with a water slide, outdoor hot tubs and a pool bar. The resort also includes facilities for health and beauty, including a hair salon, a health spa and a fitness center. For those who prefer sports, guests may choose from miniature golf, tennis, volleyball or basketball. The resort also provides activities to keep kids active as well as a playground. If you feel the need to stay connected, guests may use the business center - complete with meeting facilities and copy and fax services. 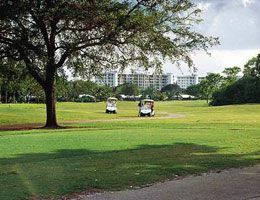 Guests who buy Wyndham Palm Aire have a number of activities at their disposal. Visitors may relax on the beach or enjoy boating and fishing in the marina. Water sports include SCUBA diving, water skiing, jet skiing, parasailing and wind surfing. For those who prefer more mellow fun, there are many shopping and dining venues in addition to parks, museums, theaters and art galleries. For a secured spot in one of these relaxing vacation units, consider owning a timeshare. Timeshare ownership allows guests to enjoy the perks of Wyndham Palm Aire every year. The activities, beaches, shopping and entertainment venues will never be out of reach with this style of vacationing. The most affordable means of owning a timeshare is seeking your unit on the resale market, saving you a significant amount off the purchase price when compared to buying new from the resort. The same advantages found in new properties are provided here through resale purchasing, so take a look at the inventory on offer at BuyaTimeshare.com and begin planning your next getaway today.